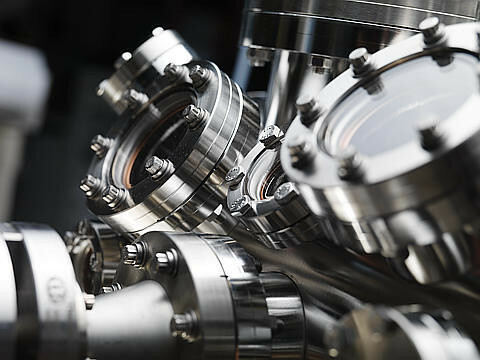 PNNL post-doc fellows are using powerful mass spectrometers to develop a detailed molecular-level understanding of reactions necessary for improved catalysts. RICHLAND, Wash. — The Department of Energy's Pacific Northwest National Laboratory has selected the first-ever recipients of the Pacific Northwest Distinguished Post-Doctoral Fellowship. Grant Johnson and Xiao Lin have been chosen as the first two distinguished post-doctoral fellows at PNNL. As part of the selection process, both candidates presented independent research proposals and, through the fellowship program, will receive funding to conduct their proposed research at PNNL for the next two to three years. "We believe strongly in building the next generation of scientists and in advancing the frontiers of science," said Steven Ashby, deputy director for science and technology at PNNL. "I'm pleased we'll be able to expose these scientists to the unique capabilities, instrumentation and experts at PNNL while we also learn from their new ideas." Johnson completed his doctorate in chemistry in July 2009 from Pennsylvania State University. There, he focused on analyzing the use of different types of oxygen in reactions stemming from metal oxide catalysts. At PNNL, Johnson's research will focus on using mass spectrometry as a tool to create new catalytic materials. Lin has most recently worked as a Humboldt Fellow at the Fritz Haber Institute of the Max Planck Society in Berlin, Germany. While at PNNL, Lin will develop a detailed molecular-level understanding of the reactivity of carbon oxides with different types of surface structures, which should have applications in understanding catalysts. In 2009, PNNL created the Pacific Northwest Distinguished Post-Doctoral Fellowship to attract outstanding researchers and build the future of scientific leadership for the Laboratory. These distinguished post-doc fellows receive a competitive salary, benefits and relocation expenses, plus potential extra funding for travel and conferences. The application process for the 2010 fellowship has begun. Applications are due no later than January 31st, and a preliminary review of current applicants has already begun. More information can be found on the program website, http://www.pnl.gov/research/pnwpostdoc.asp. Questions may be referred to university.recruiter@pnl.gov. PNNL also hired more than 90 post-docs in the past year. Those positions are separate from the distinguished fellowship program.